Award-winning Australian singer-songwriter Francesca de Valence has sat in the top 10 on the iTunes charts and the AMRAP radio charts with her new album release “Own Self”. The album has been touted “the greatest debut of any Australian artist this side of the millennium" by the Australian Songwriters Association Magazine and one of the songs has been awarded an Australian Songwriting Award. Francesca is a seasoned performer and has supported international artists including Belinda Carlisle and Michael Bublé. When she’s not writing songs and touring, Francesca is a lecturer at the Queensland Conservatorium of Music and a contemporary voice specialist holding a Masters of Music specialising in vocal pedagogy. She founded the “I Heart Songwriting” Club in 2014, which has nurtured songs that feature on albums and in musical theatre shows worldwide. Francesca is also a presenter at national conferences in songwriting and pop singing. 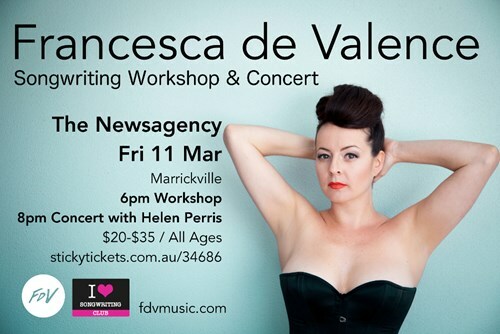 Francesca will present a special songwriting workshop and concert at The Newsagency. In this exclusive event, Francesca will share her songwriting process, demonstrate some ways to get started or unstuck and explore songwriting tools to enhance your songs. The concert will feature special guest artist and “I Heart Songwriting” Club member, Helen Perris. Book now to avoid disappointment. Tickets are limited.